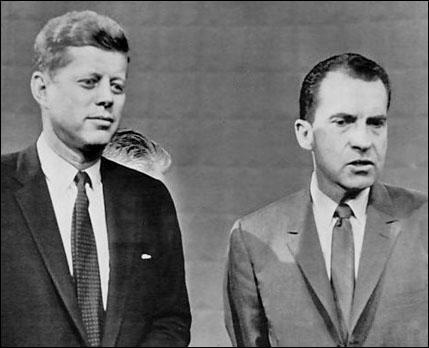 John F. Kennedy and Richard Nixon before the final presidential television debate. 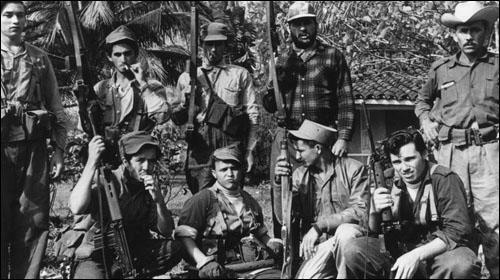 Cuban soldiers prepared for the invasion. A capured member of the Brigade 2506. (A1) In 1953, Fidel Castro complained about Cuba's economic relationship with the United States. With the exception of a few food, lumber and textile industries, Cuba continues to be a producer of raw materials. We export sugar to import candy, we export hides to import shoes, we export iron to import ploughs. (A2) After Nikita Khrushchev of the Soviet Union met Fidel Castro in New York in 1960 he told a colleague what he thought of him. Castro is like a young horse that hasn't been broken. He needs some training, but he's very spirited - so we will have to be careful. (A3) In his book The Perfect Failure, Trumbull Higgins argues that Kennedy had a strong dislike of Fidel Castro and had been discussing his removal even before he became president. As early as October 1960 Kennedy had discussed with his conservative friend Senator George Smathers of Florida the likely reaction of the American public to an attempt to assassinate Castro. Alternatively, Kennedy and Smathers had considered provoking a Cuban assault upon the base at Guantanamo to provide an excuse for a U.S. invasion of the island. (A4) Terence Cannon was born in the United States but in the 1960s lived and worked in Cuba. In his book, Revolutionary Cuba, Cannon discusses the air-raid on Cuba on 14th April, 1961. Nine CIA planes had taken off that morning from Puerto Cabezas (Nicaragua): eight for Cuba and one directly to Miami... each plane bore an imitation of the Cuban Air Force insignia. The single pilot bound for Miami was to arrive there just after the others had bombed Cuba... An enterprising reporter got close enough to his plane to notice that dust and grease covered the bomb-bay doors and that the muzzles of the guns were taped shut. The plane had obviously not participated in any attack. 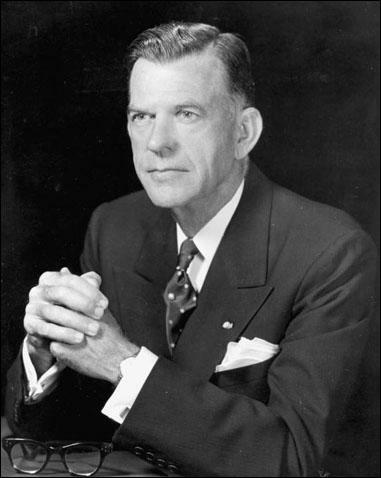 (A5) Peter Bourne worked as an assistant to President Jimmy Carter. After meeting Fidel Castro in 1979 he decided to write a book about him. 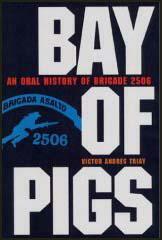 In the book he dealt with the Bay of Pigs incident. One plane that took off from Nicaragua with the others did not engage in the raid, but flew to Miami with an engine deliberately feathered by pistol shots. When it landed, the pilot claimed that he was a member of Fidel's air force who had defected after bombing his own airfield... Knowledgeable journalists noticed that his B-26 had a metal nose cone while those in the Cuban air force were made of Plexiglass. (A6) After the bombing raid on 14th April 1961, Fidel Castro made a speech to the Cuban people. The imperialists plan the crime, organize the crime, furnish the criminals with weapons for the crime, pay the criminals, and then those criminals come here and murder the sons of seven honest workers. Why are they doing this? They can't forgive our being right under their very noses, seeing how we have made a revolution, a socialist revolution. Comrades, workers and peasants, this is a socialist and democratic revolution of the poor, by the poor and for the poor, we are ready to give our lives. 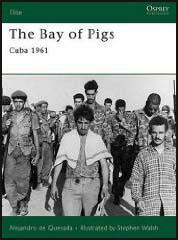 (A7) In 1961 the Cuban government published details of some of the 1,197 prisoners Involved in the Bay of Pigs invasion. Occupations: 100 plantation owners; 67 landlords of apartment houses; 35 factory owners; 112 businessmen; 179 lived off unearned income; and 194 ex-soldiers of Batista. Total property owned in Cuba: 923,000 acres of land; 9,666 houses and apartment buildings; 70 factories; 12 night clubs; 10 sugar mills; 24 large property owners; 5 mines and 3 banks. (A8) On February 4,1962 Fidel Castro made a speech in Havana where he considered the motivations behind the Bay of Pigs invasion. What is hidden behind the Yankee's hatred of the Cuban Revolution... a small country of only seven million people, economically underdeveloped, without financial or military means to threaten the security or economy of any other country? What explains it is fear. Not fear of the Cuban Revolution but fear of the Latin American Revolution. (A9) After the Bay of Pigs, Philip Bonsol, the United States Ambassador in Cuba, wrote about the failed attempt to overthrow Fidel Castro . The Bay of Pigs was a serious setback for the United States... It consolidated Castro's regime and was a determining factor in giving it the long life it has enjoyed... It became clear to all concerned in Washington, in Havana and in Moscow that for the time being the Castro regime could be overthrown only through an overt application of American power. When I came back (from Cuba), I wrote a top secret report, and I had five recommendations, one of which was the one that's always been thrown at me, is that during... or... slightly antecedent to an invasion, Castro would have to be neutralized - and we all know what that meant, although I didn't want to say so in a memorandum with my name on it. Another one was that a landing had to be made at such a point in Cuba, presumably by airborne troops, that would quarter the nation, and that was the Trinidad project; cut the communications east to west, and there would be confusion. None of that took place. Once, when I came back from Coconut Grove and said, "What about... is anybody going after Castro? Are you going to get rid of him? ", "It's in good hands," was the answer I got, which was a great bureaucratic answer. But the long and the short of it was that no attempt that I ever heard of was made against Castro's life specifically. President Idigros Fuentes of Guatemala was good enough to give our Cuban exiles two training areas in his country, one in the mountains, and then at (Retardo Lejo) we had an unused airstrip that he gave over to us, which we put into first-class condition for our fighter aircraft and our supply aircraft, and we trained Cuban paratroopers there. And the brigade never numbered more than about 1,500, which was 10 times more than Castillo Armas commanded. We went to Cuba many times. At that point in time Carlos Prio was President of Cuba and Batista was in exile. It was Lanksy who was instrumental in getting Prio to allow Batista back into the country. He came back into the country and one day he just walked into the Presidential Palace apparently, and made Prio an offer he couldn't refuse... Batista was always in Lansky's pocket. So we were back and forth there in regards to the casinos. Later on, when Castro started kicking up a force, and of course after he had landed there in the Escambay Mountains, Lansky, to hedge his bet, began offering assistance to Castro in the form of money and arms that were flying in. So although he was a very close friend of Batista, he was still assisting Castro. Around that time flying arms to Castro was no problem. The State Department didn't bother you at all. They just tolerated it.